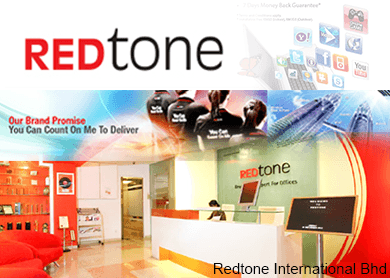 KUALA LUMPUR (Mar 27): The trading in the securities of Redtone International Bhd has been suspended on the Ace Market from 2pm to 5pm today, pending a major corporate exercise, which would be released by today. In an announcement with Bursa Malaysia this afternoon, the telecommunication service provider said that this was after its request to Bursa for the suspension. Notably, both the Sultan of Malaysia’s Johor and Tan Sri Datuk Seri Vincent Tan Chee Yioun had been acquiring more shares in the company last week. On Mar 16, Redtone (fundamental: 2.30; valuation: 0.30) saw 74.61 million shares, or 11.21% equity interest, traded off market. The shares were transacted at 80 sen through direct deals, for a total value of RM59.69 million. According to a filing dated Mar 16 with Bursa Malaysia, Redtone said that the Sultan of Johor had raised his stake in the company to 20% from 4.8% after converting warrants into stocks and buying shares in the open market. Sultan Ibrahim Sultan Iskandar had been accumulating shares in Redtone for the past one year, the company noted in a press statement dated Mar 16. It is worth noting that Sultan Ibrahim acquired the 74.61 million shares from Redtone chairman and non-independent non-executive director Datuk Sri Syed Ali Bin Tan Sri Syed Abbas Al Habshee, who owns 10.53% equity interest in Redtone after the disposal. Announcements to Bursa revealed that Tan had also been acquiring stakes in Redtone through a private vehicle named Juara Sejati Sdn Bhd. The latest acquisition of six million shares in Redtone by Tan was done through open market on Mar 12. He now holds a direct stake of 28.29% in Redtone as compared with a 13.84% stake in Nov 6 last year. Redtone was last traded at 83 sen today, with some 289,200 shares traded. It had climbed 27.61% to a five-year high of 88 sen on Mar 17 from 69 sen on Dec 16 last year. Its market capitalisation was at RM552.3 million.